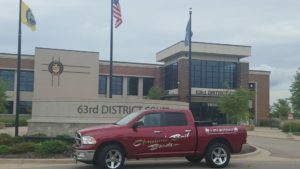 If you would like assistance in posting Kent County bail bonds in Grand Rapids Michigan, call Christine’s Bail Bonds and one of our professional agents will be more than happy to help. Christine’s Bail Bonds can assist you in posting Kent County bail bonds 24 hours a day 7 days a week. The District and Circuit Courts in Kent County usually have bond information available at the Kent County Jail by 4:30. Posting bail bonds between 3:00 – 4:30 p.m. takes longer than usual so we try to schedule meetings before or after this time at the county jail. This is due to shift changes and court updates. We can have your loved one out of jail within 1 hour of our initial meeting. There are multiple Courthouses in Kent County Michigan. If you are directed to be in “District Court” , make sure you know which one you need to go to. Home to the city of Grand Rapids, Kent County has long been the economic center of West Michigan. When they organized it in 1836, legislators named the county after New York legal scholar James Kent. According to reports, the state was rewarding Kent for having represented Michigan in its legal battle with Ohio over the Toledo Strip. The new county was delineated from the existing Kalamazoo County. Evidence of burial grounds suggest that the ancient Hopewell Indians were long-time inhabitants of the region. By the early 19th century, the river valley in the area served as an important fur trading center. Shortly after Kent county was organized, Grand Rapids was incorporated as a village. Capitalists viewed the nearby Grand River (the largest in the state) as a favorable location to build sawmills. Accordingly, area settlers became heavily engaged in logging and then in furniture manufacturing (as well as agriculture). Today, Kent County is home to the nationally-known Steelcase Corporation, Amway, and Frederik Meijer Gardens. Having more than 600,000 residents, the county continues to experience healthy economic and population growth. Indeed, Grand Rapids has gained national attention in recent years for being one of the nation’s most livable cities. Most of the crime in Kent County occurs within the city limits of Grand Rapids, and it varies, mainly consisting of vandalism, drunk driving, arson, assault, theft, and drug-related crimes. The county’s police resources and courts are busier and more taxed than those of surrounding counties which makes an arrest a longer process. If you need professional help navigating Kent County’s bureaucracy, Christine at Christine’s Bail Bonds is always there to call upon.